Robert Downey Senior is one of the great underground film makers of the 1960s and 70s. Like his contemporaries John Waters, Hal Ashby and John Cassavetes, Downey’s films were low-budget, often filmed on grainy, badly damaged film stock in grimy New York apartments with friends and family doubling as various characters. This would account for the cheap look of many of his early films. 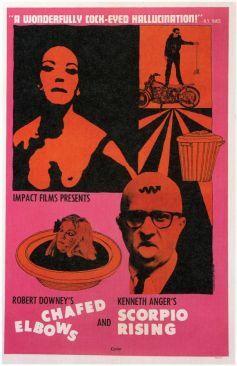 Even in those that found greater success and a more expansive audience, such as the advertising satire Putney Swope and the acid western Greaser’s Palace, Downey would maintain this grungy and frankly amateurish aesthetic throughout the rest of his career. What make his low-budget efforts stand out from others of the period are the humour of his scripts and the invention of his homespun production design. Using a mixture of still shots and live action, Downey’s camera zooms in and out of a day in the life of a young drifter who wanders around New York, between working nickel-an-hour jobs as a film extra and waiter at a private bar mitzvah whilst maintaining an incestuous relationship with his mother and giving birth to a disappointingly slim pile of dollar bills. Downey’s dialogue is sharp, quick and always unexpected, and he never lets his characters’ motivations or behaviour get in the way of a good gag: this makes the film about as even as a jelly pie on a seesaw, and all the better for it. In the hands of a different director with a perhaps more socially conscious agenda, the narrative of dead-end jobs and incestuous romances could have turned into a grim affair that perhaps would have captured better the angsty mood of the times, but would have lost a great deal of humour in the process. But in Downey’s hands, Chafed Elbows turns into an outrageous and cartoonish ride around town. All of the characters in the film seem to originate from the children of Looney Tunes babysat by the Marx Brothers and schooled by the Goons, and Downey hits the ground forever running with a fluid and exciting pace that he apparently borrowed from the Truffaut/Godard films of the French New Wave. Consistently off-beat, joyfully irreverent and mercifully short (at only 57 minutes in length, its grainy look and poor sound quality can be forgiven), Chafed Elbows is an unexpected early delight from a master of the wacky and the weird. Downey’s later films Putney Swope and especially Greaser’s Palace are more technically accomplished and consistent in tone, with film makers as diverse as Jonathan Demme, Paul Thomas Anderson and Jim Jarmusch each claiming to have been inspired by them. But Chafed Elbows, for all its technical inhibitions, is still to my mind the funniest of Downey’s efforts that I have seen. Chris Middlehurst is The New Jurist film review editor. Chris graduated from Leeds University with a BA in English Literature, where he served as President of the LUU Film Making Society and also took elective modules in Chinese, Italian and World Cinema. He currently lives in Leeds and volunteers regulary at the wonderful Hyde Park Picture House, where he urges film lovers to visit if they get the chance! Tolerance is not a virtue, and it should not be promoted as such. Rehabilitating inmates through education is cheaper and more effective. There is tension between impulses to peace and war, violence and nonviolence. Access to justice is the prerequisite for the rule of law. The last remnant of the death penalty in the UK was abolished in 1998. Treason is perhaps the most infamous crime in English Legal History. Jury trial is regarded as the cornerstone of democracy and the rule of law. Burglary is a crime which has changed significantly over the years. Defamation remains a popular action and cases involving it are in news headlines.